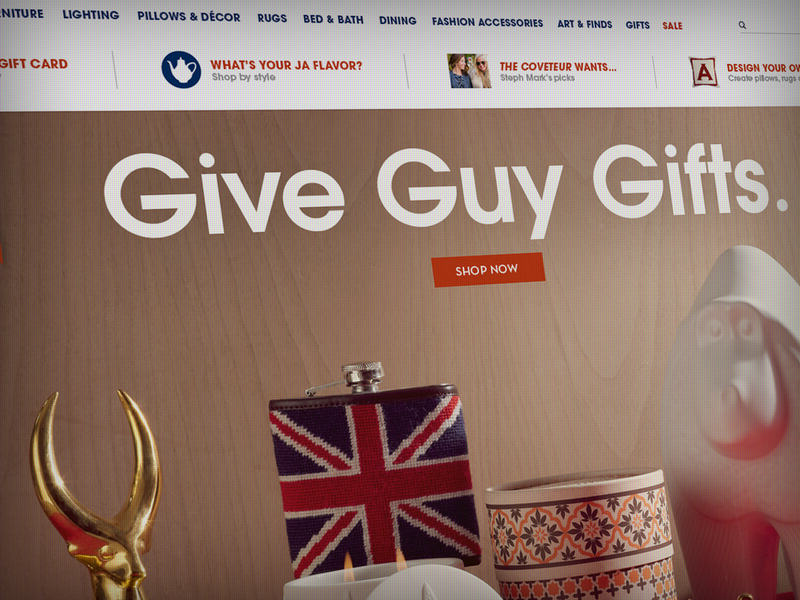 Jonathan Adler needed a clean, updated look for jonathanadler.com to launch the web version of his Holiday 2012 catalog. The theme was Style, Craft, Joy. So we grouped Jonathan's gift picks into categories and shot them with a 'Wes Anderson' feel—keeping the photography modern while giving a nod to vintage crafty Christmas images straight out of the 1950s and '60s. Holiday 2012 hijacks jonathanadler.com: The homepage got a facelift, featuring large, full-screen images that rotated and changed every week, plus graphics and a color palette that matched the Holiday 2012 store campaign. A seamless experience from store to site. Each set of gifts encouraged the viewer to give: Give Craft; Give a Hoot; Give Peace, Love and a Little Bit of Lust; Give Generously; Give Good Face; Give Stocking Stuffers; Give Good Hair; Give Gold; Give Pretty Presents... There was no shortage of unique gifts to give. But our concept shifted the focus away from blatantly advertising Jonathan Adler products and instead integrated them editorally, giving jonathanadler.com Holiday 2012 it's own identity while still benefiting the brand. In order to reach Jonathan Adler's goal of making jonathanadler.com a space for shoppers to explore product in new, engaging ways, links to web features were still given top billing, allowing users to instantly start exploring. We saw that users still preferred to shop by category via the nav bar, so the navigation design was cleaned up and simplified. But it was all about the big, center-stage image. The bold photography paired with a simple, sometimes humorous message was our hook, aimed at grabbing attention and pulling the shopper deeper into the Holiday gifts section and, ultimately, the rest of the website. Each homepage image could also be made fully shop-able so customers could bypass the Gifts page if a featured item caught their eye, and go directly to the item's product page to buy it. Unfortunately, just a few weeks after the Holiday 2012 photo shoot I left the company and the web campaign was taken in a different design direction. In the days following, the homepage did undergo a clean facelift with larger imagery at it's core. Hopefully my design helped to inspire, and ultimately challenge the way the brand viewed it's online shopping experience, showing that visually engaging pages and seamless application of branded visuals between store and site can do wonders for brands with a strong brick-and-mortar and ecommerce presence like Jonathan Adler. During my two years on staff at Jonathan Adler Enterprises I created lots more work—I lived and breathed long, story-focused email blasts and product-centric homepage updates on a weekly basis. Contact me to see more of the work. I also created a bunch of work during the short time I was contracted as a web designer at Brooklyn Industries. Contact me to learn more.